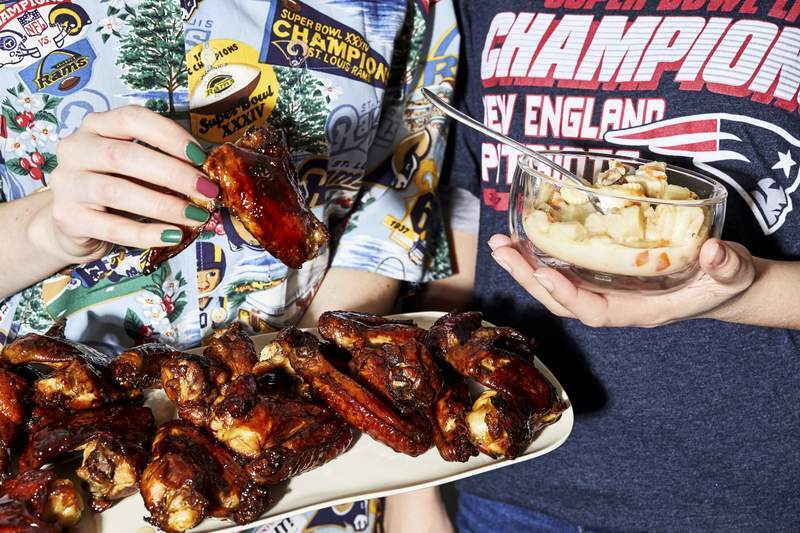 Planning a Super Bowl party and not real sure what to make? 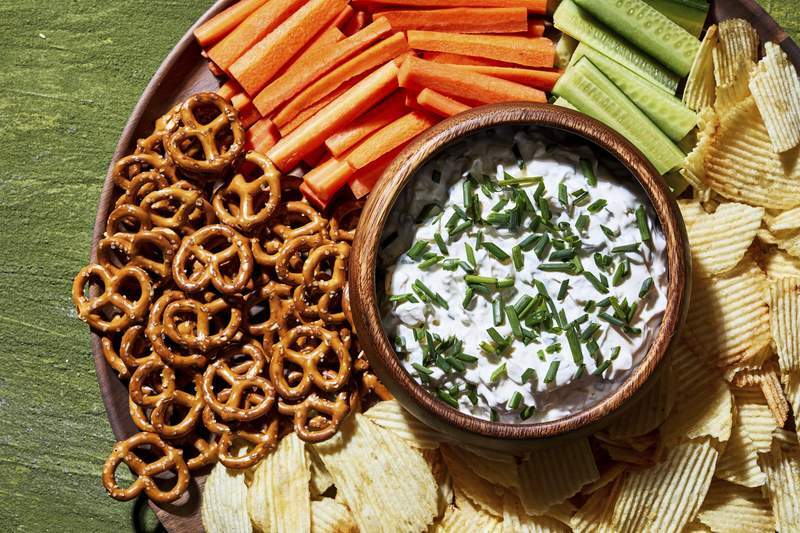 It appears that if you stick to burgers, dips, pretzels and chili, you can't miss when it comes to popular football party foods. JustAPinch.com, an online database of user-posted recipes, researched football party foods to find what was most popular with America's home cooks. By using data from millions of cloud-based recipe boxes to find the most saved, viewed, shared, rated and cooked recipes, JustAPinch came up with its list. On this list you'll find plenty of cheesy, bacon-y foods, but there are some trends emerging, such as creative and healthy spins on traditional foods like baked chicken wings, BLT pasta salad, veggie cream cheese roll-ups and jalepeño popper wontons. Making the list is burgers, meatball sandwiches, chili, chicken wings, dips (including cheesy sausage and queso dip), fries and steak fries and ham sliders. Super Bowl is here. Be ready to entertain or be entertained with a selection of party dishes in all the major food groups: Chicken; soup and chili; dips and snacks; and pizza, bread and sandwiches. • To cut down on expenses and work, make it a potluck. Assign specific dishes or food groups. For the friends who don't cook, ask them to bring ice, drinks or a roll of paper towels. • Make sure you have enough utensils and plates for everyone. If you don't want to buy disposable, consider asking one or two friends (preferably friends who drive and/or live close by) to bring a set of silverware, plates and glasses to supplement your supply. • You'll feel better about life if you are as cleaned up as possible before everyone arrives; don't keep a pile of just-used dishes in the sink to clean up later, when every surface of your kitchen is inevitably filled with more dirty dishes. • Build your food spread around finger foods and small bites to cut down on utensil requirements. • If you run out of bowls for your soups and chilies, use mugs. Think about where you'll spread out your array of dishes – the kitchen counters? Your table? On a board balanced on two boxes and covered with a sheet to mimic a tablecloth? You've got options. People are going to bring beer, and you're going to need room to keep it cold; if you don't have room in your refrigerator, fill something else with ice and stick the beer in there. Things we have seen people on the internet and in movies use: A washing machine, bath tub, empty plant pots, buried in the ground outside. Note: When using an un-insulated vessel to pour ice into and stash your beverages, it is wise to wrap a few towels around and under said vessel, to help with condensation. Any ol' person can make chili and order pizza. Make your party something special by getting a little more creative with the food. Put a rack in middle of oven and preheat oven to 400 degrees. Arrange wings in one layer in a large roasting pan. Combine the soy sauce, wine, sugar and ginger in a small saucepan and heat over moderately low heat, stirring, until sugar is dissolved. Pour evenly over wings. Bake for 30 minutes. Turn wings over and bake until sauce is thick and sticky, about 1 hour more. Transfer wings to a platter. In a large skillet over medium heat, melt the butter. Add the onions, reduce the heat to medium-low and cook for 10 to 15 minutes, stirring occasionally, until the onions just begin to turn golden. Add the scallions and cook for 3 to 4 minutes, stirring. Remove from the heat; add the chives and mix well. Transfer the onion mixture to a bowl and set aside to cool slightly. While the onion mixture is cooling, combine the sour cream, cream cheese and salt in a medium bowl. (These can be mixed by hand if the cream cheese is soft or in a food processor if the cream cheese is still firm.) Add the onion mixture and stir to combine. Taste and add salt, if desired. Cover and refrigerate until ready to serve.